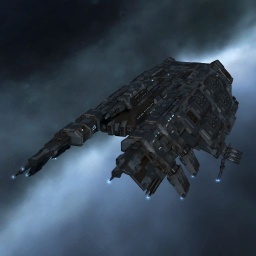 After the resounding success tied to the launch of the Drake-class Battlecruiser, the Caldari Navy signed up a massive order to acquire a specific version for its own arsenals. The outcome, the Drake Navy Issue, while sharing a similar look with its step-father, serves a completely different purpose on the battlefield. Being more mobile, able to project missiles more effectively at range, against smaller targets and on a wider selection of damage types, this ship is ideal to support small scale conflicts and raids. Introduced with the Odyssey expansion, the Drake Navy Issue (aka the DNI) is the faction version of the hugely popular Drake battlecruiser. It loses the Drake's resistance and kinetic damage bonuses in favor of more shield, two more launcher slots, and bonuses to missile velocity and explosion radius. The resistance swap for shield size slightly favors the DNI and improves with skills, but what really changes is the way the DNI engages targets. It gains a huge range boost, targeting and hitting targets past 70km with lvl 4 skills and heavy missiles. It does approximately the same amount of damage as the vanilla Drake, but now uses a variety of mission-specific missiles (which gives it equivalent DPS to all rats, not just kinetic-vulnerable ones) and deals much better with frigates. It's also faster and more agile due to weight loss. However, you lose the high utility slot and your wrecks are going to be more spread out (because you engaged them further away), so a new DNI owner will probably stop self-looting their L3 missions in favor of completing them faster. You can also equip your DNI with HAMs for a 100+ DPS increase at the expense of half your range, half your tank, and 10,000 EHP. Caldari Battlecruiser to at least IV to take advantage of the Drake Navy Issue's strong damage application. Missile skills depend on your use for the DNI. L3 mission fits use Heavy Missiles; train to IV and use Arbalest (Meta 4) or Caldari Navy HMLs. Drakes are widely used in factional PvP, and Heavy Assault Missiles can be trained for that to IV minimum. T2 launchers and the accompanying T2 ammo requires Heavy Missiles/Heavy Assault Missiles V and Heavy Missile Specialization/Heavy Assault Missile Specialization to at least I; this is a 10-day-ish train that isn't worth it if your intent is only to get to L4 missions. However, it can be worth it: you'll get to use T2 HMLs on your Tengu down the road, and if you're grinding reputation, there are a lot more L3 missions in your future. Drones V, Combat Drone Operation V, Drone Interfacing IV and Gallente Drone Operation I/Minmatar Drone Operation I are all are important for getting as much DPS out of the 25m3 drone bay as possible. Due to the Drake Navy Issue's inherent shield tanking ability, Shield Operation, Shield Management, and Tactical Shield Manipulation should be trained to at least IV to improve shield capacity, recharge rate and impenetrability. Shield Upgrades should be trained to IV to allow the use of T2 Shield Hardeners, Resistance Amplifiers, Shield Power Relays, Shield Extenders and Shield Rechargers. If you are using passive shield hardeners, EM Shield Compensation, Thermal Shield Compensation, Kinetic Shield Compensation, and Explosive Shield Compensation trained to level IV will further improve shield resistances. Note these skills have no impact on Adaptive Invulnerability Fields or other active hardeners. Shield Rigging 1 is necessary for the Medium Core Defense Field Purger I rig, and Launcher Rigging IV is necessary for a Medium Warhead Calefaction Catalyst II rig to improve DPS instead of tank. No sub-article about Drake Navy Issue roles or piloting tactics. You can write them here. No notes for Drake Navy Issue. The Navy Drake is getting a changed skill bonus, with the previous missile velocity bonus leaving to make room for the shield resistance bonus enjoyed by the T1 Drake. Extra powergrid and drones open up a lot of new options for this ship, and it's gaining some of the biggest mobility bonuses (making it the most agile of the Navy BCs). Caldari Battlecruiser skill bonuses: +10% to heavy missile and heavy assault missile velocity and 5% bonus to explosion radius of heavy missile and heavy assault missile per level. Slot layout: 8 H, 6 M, 4 L, 0 turrets, 8 launchers. Fittings: 900 PWG, 550 CPU. Defense (shields / shield recharge time (s) / armor / hull) : 7875 / 1800 / 4875 / 5625. Capacitor (amount / recharge rate / cap per second): 2500 / 658 s / 3.8. Mobility (max velocity / agility / mass / align time): 150 / 0.64 / 13329000 / 11.8 s.
Drones (bandwidth / bay): 25 / 25. Targeting (max targeting range / Scan Resolution / Max Locked targets): 60km / 195 / 8. This page was last modified on 10 June 2018, at 14:46. This page has been accessed 71,924 times.